For this example, we will first walk through setting up a simple lighting schedule that to lock the front door every night at 10pm. This might be great for someone that forgets to lock the door at night or teaching a lesson to the teenager that forget to come home before curfew. For a bit more of a tutorial, we will then set up a schedule for the lights to come one and then turn off 30 minutes later at random times throughout the day when we are on vacation. Name: Lock Lil Johnny out after 10pm. That's it. One window, click some boxes, select from a pull down menu and slap your desired name on it and you have schedules the front door to lock every night at 10pm. You could repeat the same steps for the back door if you like. There are specific things that each device will do, just check your pull down menu under "Actions" to see what can be scheduled for each device. It's pretty basic; cameras take video clips and pictures, door lock and unlock, etc. So not so bad here. Even with a fairly complex request, it's just a box with several options and you select the ones that you desire. Under the "Actions" area, after you select each action, you have the option to "Add Another Action" so you could turn several lights on and off or possible turn the lights on and take a picture of the driveway to assure that your classic hot rod isn't being driven away while you're sipping a Martini. Home Automation is all about taking a system and bending it to around your life. Here's a few schedules that might surprise and delight you. Your sprinkler system. With California residents on highly restricted water use plans, placing a standard sprinkler timer to always on, then plugging it into an appliance module will let you set your watering schedule through your ADT Pulse Web Portal. Like all schedules, it will run fully automated yet, you have the options to check in with any mobile device and manually switch it off or on. Do this anytime of day from anywhere you and your mobile device go. Home Theater. With your power strip run through an appliance module you can schedule it to power down from midnight to 6am and cut out the power drainage. If you or your man is as techy as my husband, that's shutting down 10 components that even in standby mode are pulling a small amount of power each while the family sleeps. That's every single night of the year... it's gotta add up. Coffee Maker. Warning: this only works with a coffee maker that is activated simply by plugging it in or connecting it to power. Again the amazing appliance module takes whatever is plugged into it and you can toggle the power through your Pulse system. Schedule power to your coffee maker 10 minutes before your alarm and wake up to the smell and taste of fresh coffee. That's a few ideas that will hopefully get you thinking out side of the box and personalizing your home automation to the way you travel through his world. My personal favorite is laying in bed, realizing it's colder than usual and turning the heater on from my phone. You're all set. Go set up a schedule today. It's easy. In fact nothing about the ADT Pulse system is hard, it's mostly pull down menus and clicking boxes to decide what option you want and when. The exciting stuff is combining schedules with other function that create a "The-world-revolves-around-me" system. Because your home's automation is all about you! So you now have the front door locking at night. Let's say you really do have the wayward teen that will swear they got home at 10:06 and you're making a mountain our of a mole hill. You might want to set up an alert that sends you a text message so you know what time they really unlocked the door and came in. Click that link and learn all about text and email alerts. You can also email the pictures of your hot-rod to your cell. No better way to relax and really enjoy your Martini than knowing that "Elanor" is safe in the driveway unharmed. Also read up a bit on setting up modes. 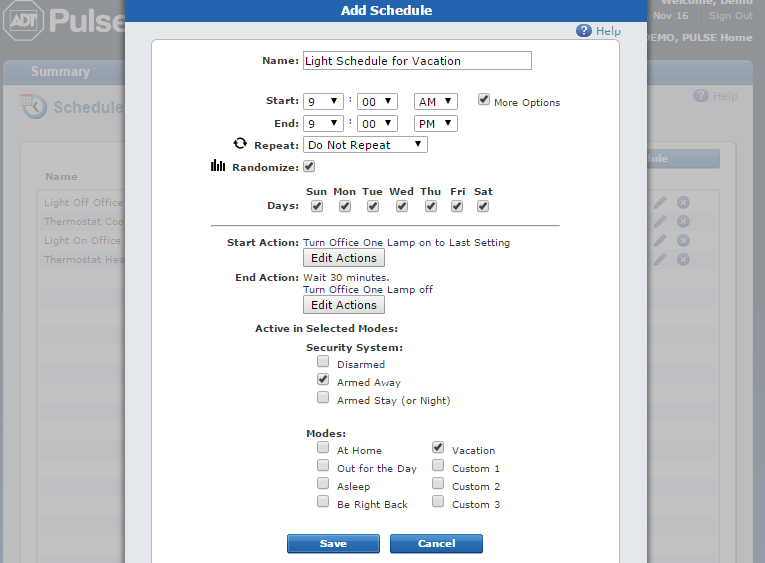 That vacation mode can have a few more things scheduled, and can alert you of more than teens and cars. There are also automations you can tie in. An automation is something that is triggered by another event. Have the thermostat heat things up a bit if the temperature falls below 40. You sure don't want pipes freezing and bursting while you are away. If the front door camera detects motion near the door, you might want it to take a video clip and sent it to you (send you a text or email alert.) Learn all about setting up automations here. 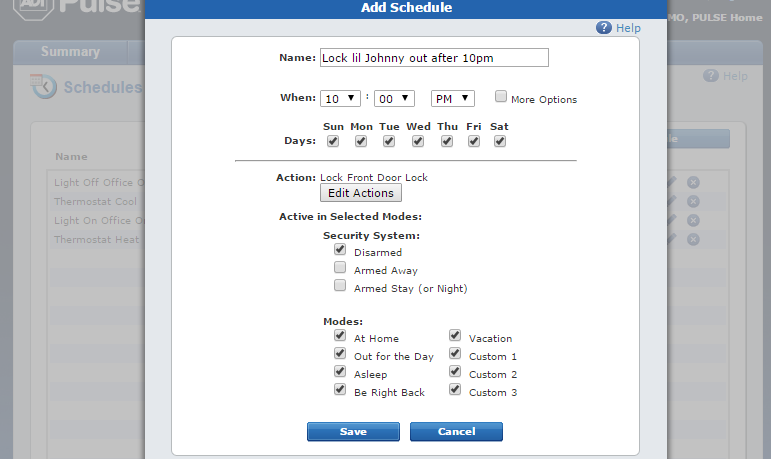 If you are not experiencing ADT Pulse, schedule your FREE security review today!